How efficient are the cremation pyres used by Hindus in observance of their religious funeral rites? Why do Holocaust deniers even care? The cremation grills used at Sobibor, Treblinka, and Belzec were terribly designed. The cremation grills should have been designed like a Hindu funeral pyre, where the remains rest directly on the wood. This design would have been far more efficient than the grills the Nazis allegedly used. The example of a Hindu cremation pyre is not a helpful comparative model for the mass incinerations at the Operation Reinhard death camps of Treblinka, Belzec, and Sobibor. Actually, evidence shows that the Hindu method of cremation is much less fuel efficient than the mass cremations at these camps. What is the process by which the Hindus cremate their dead? Hindus believe that the body is only an instrument to carry the soul. After death, the soul disengages from the body. The purpose of cremating remains is to dissolve the material bond between the soul and the physical body. This allows the soul to smoothly transition to the astral world. In a Hindu cremation, the remains are placed directly on a pile of wood and, after a series of rituals, set ablaze. Each pyre consumes between 272 kilograms (600 pounds) to 400 kilograms (880 pounds) of wood. The total cremation process lasts about six hours. Hindu funeral pyres are so inefficient in terms of wood usage that the estimated 8.5 million cremations performed annually is an ecological nightmare; it requires an estimated 50,000,000 trees! In terms of what Holocaust deniers claim, this is ironic: some Holocaust deniers often also claim that supposed mass cremations during the Holocaust would have used an impossibly high amount of wood, an amount of wood that would have stripped whole forests bare. By assuming the efficiency of Hindu funeral pyres, these Holocaust deniers unknowingly hold contradictory propositions. Some authorities in India now question the efficiency of tradition Hindu funeral pyres. Calling the method of laying the body directly on the wood an example of “inefficient combustion,” experts in India are currently promoting the use of new systems for cremation. They want the new cremations to provide more oxygen for combustion, resulting in the use of only about 100 kilograms (220 pounds) of wood per cremation. The Nazis’ cremation grills differ greatly from a single Hindu cremation pyre: (1) the number of remains (about 2,000) on each grill at the camps, (2) the close proximity of the remains to each other (they were piled several feet high at the camps), and (3) the large size of the grills at the camps (about 66 square meters or 710 square feet). These conditions would have contributed significantly to the combustion process. Once the fire had been started, this reduced or eliminated the need for constantly adding more wood. In addition, the flow of oxygen under the grill would have aided the process, making it more fuel efficient—just as experts in India are advocating today. The Hindu cremation pyre is not a helpful comparison for the mass incinerations at the Operation Reinhard camps. Evidence shows that the Hindu method of cremation is much less fuel efficient than the mass cremations at Treblinka, Belzec, and Sobibor. See “One Third of the Holocaust” at http://www.youtube.com/watch?v=taIaG8b2u8I at approximately 3:05 minutes. Tripti Lahiri, “New ‘green’ pyre to cool planet while burning India’s dead,” Taipei Times, June 16, 2007 at www.taipeitimes.com/News/editorials/archives/2007/06/16/2003365571; Katie Rawls, “Cremations Harm Indian’s Environment” at http://www.aboutmyplanet.com/religion/cremations-india%E2%80%99s/ ; Bruce Wallace, “Hindus urged to adopt ‘green’ cremation,” Los Angeles Times, September 3, 2007 at www.latimes.com/news/nationworld/world/la-fg-ashes3sep03,0,4547624.story. 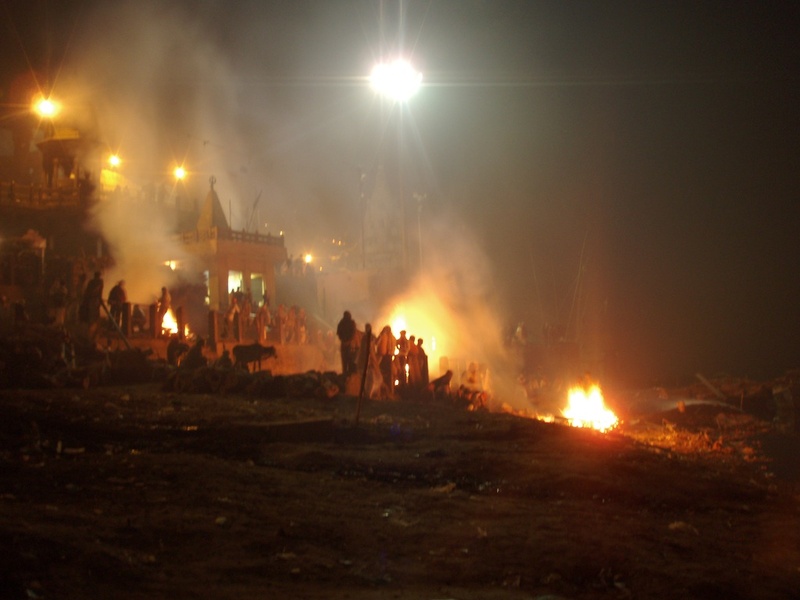 Tripti Lahiri, “New ‘green’ pyre to cool planet while burning India’s dead,” Taipei Times, June 16, 2007; Katie Rawls, “Cremations Harm Indian’s Environment”; Bruce Wallace, “Hindus urged to adopt ‘green’ cremation,” Los Angeles Times, September 3, 2007. “Mattogno, Graf & Kues on Aktion Reinhard(t) Cremation (1)” at http://holocaustcontroversies.blogspot.com/2011/03/mattogno-graf-kues-on-aktion-reinhardt.html.